WestWaters offers you the best conference, meeting, function venue and product launch rooms close to Melbourne CBD and Tullamarine Airport. We can cater for a number of different style corporate events, from smaller board meetings to large presentations and launches. *Terms & Conditions Apply. New bookings only. Experience award winning food and wine when holding a conference or event at WestWaters, and let our experienced and dedicated team assist you with your planning with your own personal conference organiser. All conference rooms are located on the ground floor allowing easy access for all delegates and are equipped with Wifi and HSIA. Additional AV & technical facilities are available upon request. Offering an escape from the usual enclosed city venues, WestWaters is perfectly located to offer the space and tranquility that only an out-of-city location can. Just 20mins from Tullamarine international airport and 25kms from the Melbourne CBD our ideal location allows easy access for local and visiting delegates. 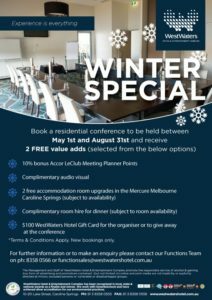 When staying in at Mercure Melbourne Caroline Springs your guests will experience the services & facilities that is expected from a 4.5 star hotel. After your conference they can take advantage of our on site fitness centre and indoor pool & spa, clear the mind with a walk or run around Lake Caroline or enjoy a leisurely drink with their colleagues in one of our bars. 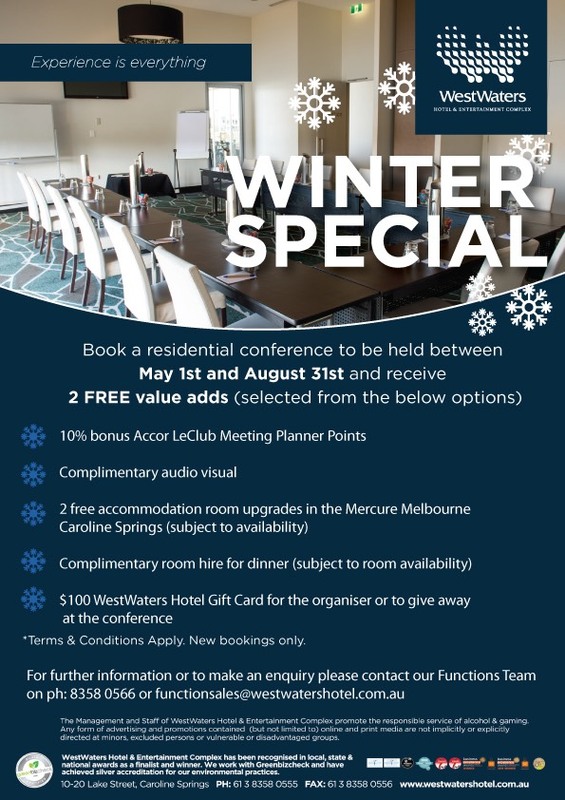 For more details please contact our Conference and Events Team on (03) 8358 0555 or click below.